Click the above line for the index. 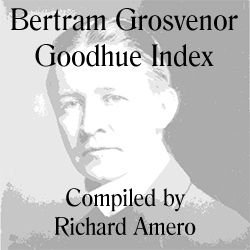 Compiled from material in the Avery Architectural and Fine Arts Library, Columbia University, New York, this 207-page index includes correspondence to and from Bertram Grosvenor Goodhue, as transcribed by Richard W. Amero. It also includes articles from newspapers, journals, and periodicals, with additional correspondence woven between. This index has not been published or made available to the public. It is presented here in its entirety as a searchable PDF. Note to authors: Since this is not a primary source document, please contact the Avery Architectural and Fine Arts Library before citing the original material.